Bright and beautiful, Winton Oil Colour is a traditional range of of 47 oil colours, made from moderately priced pigments, perfect for artists who need large quantities of colour. All of the tones have been carefully made to bring out the best of each pigment, so you can create bold and vibrant artworks. The application of traditional skills and modern colour chemistry techniques has resulted in a range of carefully selected Winton Oil Colours. This has been achieved by replacing more costly traditional pigments with excellent modern alternatives, giving excellent quality at an economical price. The full range of colours are available in 37ml tubes and 200ml tubes. A high level of pigmentation provides good covering power and tinting strength. 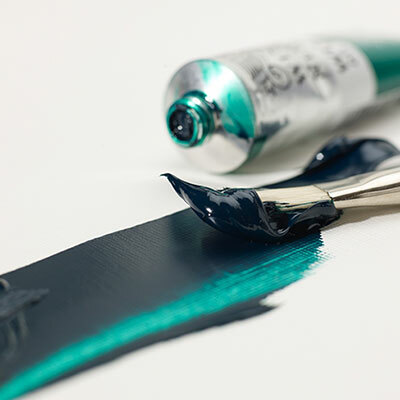 While it can't match the superior pigment load of Artists' Oil Colour, the Winton range is much stronger than many other artists' quality ranges. The economical cost has been achieved through the use of moderately priced pigments rather than lessening the pigment content to an unacceptable level. Winsor & Newton formulation, manufacture and quality control ensure a product of absolute excellence. Winsor & Newton use single pigments wherever possible to create individual colours. Combined with strength of colour, single pigments provide a wide colour range in themselves and offer cleaner, brighter mixtures with infinite hues. This is particularly important for violets, greens and oranges. Single pigment 'secondaries' considerably broaden the artist's available spectrum. The Winton range has a more uniform consistency than Artists' and is a slightly stiffer colour. It offers excellent retention of brush and palette knife strokes. Pigments vary in their transparency by nature. On the Winsor & Newton Winton Oil Colour chart and individual colour pages of this site, the transparent colours are marked with or T, the semi-transparent colours are marked or ST. The relatively semiopaque colours are marked with or SO and the opaque colours are marked with or O. Remember that the level of transparency of a colour is relative to other colours. Transparent colours are used for glazing and tinting, providing optical colour mixtures and depth of colour to the painting surface. Opaque colours cover well, give flat areas of colour and obscure/mask the underlayers of the painting. Winton Oil Colour is formulated to reflect the characteristics of each of the various pigments, ensuring that synthetic organics such as Phthalocyanines and Quinacridones [ie. "Winsor" or "Permanent colours"] deliver maximum transparency, whilst Cadmiums and Earth colours offer excellent opacity. As with the Artists' Oil Colour range, the surface sheen of Winton is largely due to the pigment used. The level of gloss will therefore vary, although Winton is more uniform across the range. Wherever possible, the most permanent pigments have been selected for use with the Winton range. The formulation and manufacturing process ensure that the product will remain stable within the tube as well as offer the most permanent paint film possible (when applied appropriately). All colours will become touch dry in 2-12 days. The different drying rates are due to the different reaction of each pigment when mixed with oil. As with all oil paintings, to avoid yellowing of the oil, paintings should not be allowed to dry in continuous darkness or with high humidity. The choice of whites in Winton Oil Colour ensure that artists have the widest possible selection, as in every other part of the spectrum. White is the most used colour. The four whites in Winton Oil Colour offer different working characteristics to the painter. The most popular modern white. It is the whitest, most opaque white. A less hazardous alternative to the traditional lead based white. This colour has been formulated to match the tinting strength and consistency of the original Flake White. The least opaque white, making it ideal for tints and glazing. A titanium based white with the softest consistency. It has lower tinting strength than Titanium White. Oil colour relies upon the variable characteristics of the pigments used in each colour in order to achieve results. Therefore, being able to choose from the widest possible range of pigments means that you have greater choice and flexibility to develop your work and technique.